Since Memorial Day Weekend, over 2,500 immigrant and refugee families have arrived at the U.S.-Mexico border, fleeing their home countries in search of safety only to be torn apart and put in detention centers, awaiting deportation proceedings. 900 families still remain separated. Launch the Central America Family Reunification and Reintegration Initiative to help parents deported without their children to locate their young ones and to provide legal, social, and psychosocial services. 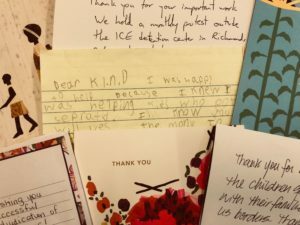 Deploy dedicated teams and resources to the Texas border to conduct intakes and provide guidance to hundreds of parents and caretakers separated from their children and held in detention. 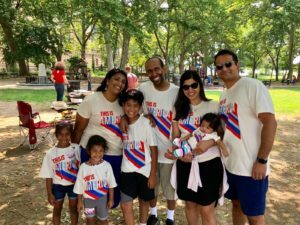 In New York City, Chicago, Philadelphia, San Francisco, and Washington DC, hundreds of supporters attended This is America fundraisers on the 4th of July, raising over $16,000 in support for KIND and RAICES. Thank you to all the attendees and donors who showed the world on July 4th that the U.S. stands for diversity, inclusion, and opportunity. Check out Twitter to see the parties in action! Some of our littlest (and mightiest!) supporters hosted a lemonade stand outside of their Chicago home. 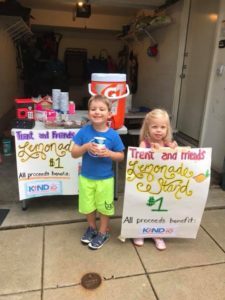 We are so grateful to Trent and his friends for taking action and helping kids their own age! Thank you to Laurel Nakai for leading the #SingForFamilies social media campaign. You can join the movement too! Upload a video of you and your friends singing a lullaby to your social media profile and include the hashtag #SingForFamilies. Once again, thank you to each and every one of you who has supported KIND during this critical time. We can’t do this work without you! P.S. If you’d like to host a fundraiser for KIND, we are here to help! Visit our fundraising page for more information and reach out to Megan Masterson at mmasterson@supportkind.org with any questions.